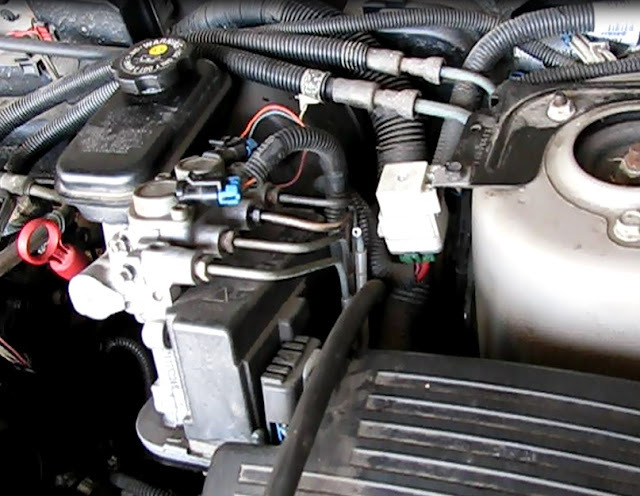 Loss of brake fluid was traced back to a rusted out brake line on a 1997 Pontiac Grand Am. It was decided that the best way to fix this was to replace the entire line, from the abs modulator to the left rear wheel. To avoid disturbing the good lines, running alongside the bad, the ends of the bad line would be cut off and the old line left intact. Breaking the job into pieces is a good strategy. The original lines may have been in one piece, but GM built the rest of the car around them! First a 40 inch steel section of premade line, complete with bubble flare fittings would be be bent to fit at the rear wheel. Then a 40 inch copper-nickel section would be fitted at the front, from the modulator to just beyond the wheel well. Finally the remaining section would be measured and a new section, as close as possible, but over- length a bit, would be purchased. The three lines would then would be joined with unions. This repair was done in about four hours with $30 worth of parts and materials. Shop labor cost for the job: ?? ?...I'd be afraid to ask! 1) Drive the car onto ramps and then jack it up at the bad wheel and remove the rear wheel for the bad line. Set that wheel down on a block. 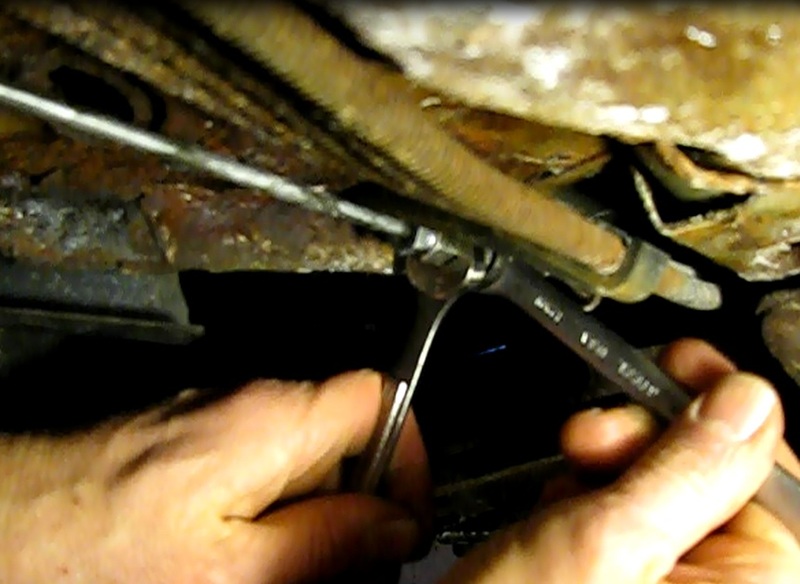 2) Cut the bad brake line a few inches from the flare nut going to the brake hose. The scope of this job did not include the brake hose, so the flare nut fitting would have to be removed from the old hose. This line is garbage anyway, so just cut the end off. 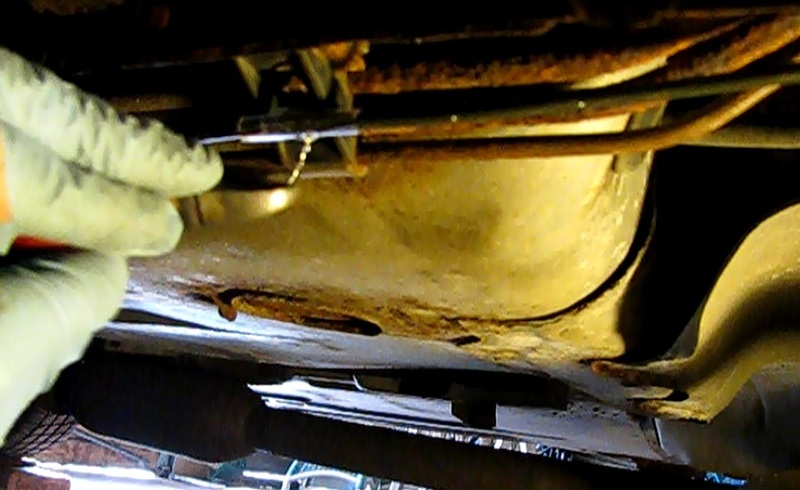 3) Put some penetrating fluid on the flare nut and try to turn it out. Yeah, give it a try. Having failed that, now remove as much brake fluid as possible from the open line (I wicked it out with some rolled up paper towel). We are going to heat this up and brake fluid is flammable.Have a fire extinguisher handy. 4) Heat the fitting with some propane or Map-pro for less that a minute and turn it out with a 12mm flare nut wrench. If this fails, the brake hose will have to be replaced too. 5) Buy and bend a new three foot section of line. If the end of that section of the old line has a few fancy bends, cut it out and use it as a template for.the new section. 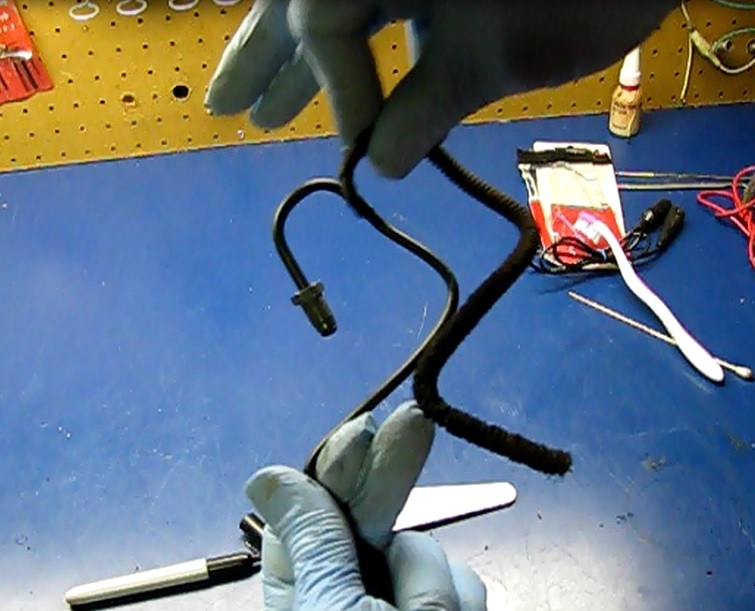 A three foot section of standard steel brake line was purchased and bent to fit. Take care when installing to protect the fittings at the ends of the line with tape. 1) Feed the new line through. The original line ran through an incredible jungle of steel lines, hoses, wiring and components. Fitting and bending a standard steel line in here would be next to impossible. I purchased some highly flexible copper-nickel line for this reason. I used fish tape to feed the new line up from the under the car to the abs modulator. Again, protect the fittings with some electrical tape. 2) Bend the line to match the bends at the modulator. This was easy with the tubing bender. 3) Routing this line to match the original would be nearly impossible and unnecessary. Instead I went with a shorter route following the right front wheel brake line around a curve inside the bottom of the wheel well. 4) Bend the lower end. This gently curving bend was easy to accomplish by hand. 1) Determine the length of line needed for the middle section. Buy the closest length available of pre-made line, going over slightly rather than under if the exact length is not to be found (there is little chance of that!). I was left with 48 inches of a nearly straight run between the front and rear sections. The auto parts stores sell a 51 inch section with the proper bubble flare fittings. I would have to lose some length somewhere. 2) Reduce the installed lines somewhere. I decided to shorten up the very bendable copper-nickel section. Bending it around a rasp three of four times near the lower end of the line did the trick. 3) Install the unions. A half inch wrench fits on the union. Don't forget the never-seize! Torque these up good or expect a leak. There are many ways to do this. I drilled a couple of holes in the plastic factory brake line holders. I decided on some vinyl tubing cut about 3 inches long and slit lengthwise. I put this over the line near an existing plastic hanger. Then I secured it with some galvanized wire. Repeat three more times near the other holders. On the corner I used a one of those automotive clips on the curving ridge under the wheel well and then used the same tubing and wire to hold it. The important thing is not to have the lines secure and not touching anything that make them vibrate and wear through. 1) Start the car several times to reset the abs modulator. The ABS light should come on and then go off after a few seconds. 2) There are two abs bleeders that need to be bled. The one closest to the master cylinder is the rear, the other the front. Bleed the rear abs bleeder till free of bubbles. 3) Bleed the front abs bleeder till free of bubbles. 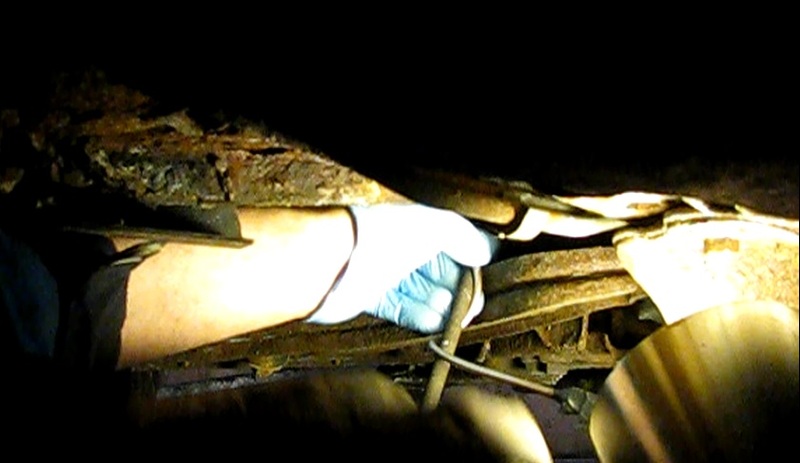 4) Bleed the right rear brake. 5) Bleed the left rear brake. 6) Bleed the right front brake. 7) Bleed the left front brake. 10) Start the car and check the feel of the brake pedal. If it feels normal, not too hard and not going to the floor, bleeding is complete. 12) Test drive the car. Done. Thank you for those good advices! I just wanted to say, my expectations from Voyager have confirmed right away as soon as I first see such miracle in the dealer center. Soon after the test drive, having consulted with my wife, I checked https://www.faxvin.com/vin-decoder/dodge reports about the used Pacifica, and we decided to buy a car with a mileage, a new one quite expensive for us, and so I did not see the sense overpay 1.5 times. As I learned from the report, the car was not in the hijack, its story, just a year, convinced me that the right choice was made. I hope you still look at these posts. I am stumped. I have replace all 4 lines running to brakes. its a 03 grand am non-ABS. I have tried bleeding it how it is said to be. but when brake pedal is pressed when car not running will build pressure but when car is running there will be no resistance on brake pedal. brake fluid did run out of system but was not used until was refilled. And this car does have some abs parts but not abs system.not sure if it would make a difference. Going to rebleed tomorrow to see if that will work.